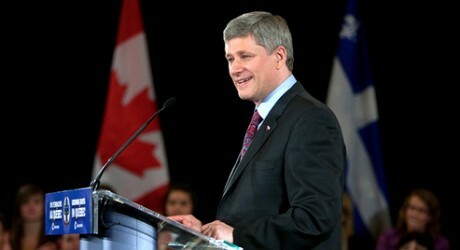 The Toronto Star reported today that the federal Tories have officially rebranded “The Government of Canada” as the “Harper Government.” While the shift is not universal, with the Vancouver Sun saying that they have received a number of federal press releases that retain the “Government of Canada” branding, the new language has been seen on releases from the Treasury Board, one of the most powerful federal departments. This rebranding, however, is the latest in a long string of efforts to move away from precisely the kind of arms-length communications bureaucracy Cross benchmarks as a democratic necessity. In the 1980s, finding the civil service wholly too l(L)iberal, Brian Mulroney undertook massive cuts to the sector, turning once non-partisan communications positions into overtly political appointments under the direct supervision of the Prime Minister and the Privy Council. When the Liberal sponsorship scandal erupted in the mid-2000s, the effects of this trajectory were made clear: federal communications initiatives had crossed the line separating government information and partisan promotion. For Cross, the move is, in some measure, expected. “The Conservatives likely have some polling data that suggests that Harper has support from some part of the population, so they’re playing up the individual in advance of a spring election, because we all know elections are about leaders.” But regardless of how typical or mundane this strategy has become, the threat it poses to the Canadian democratic process remains urgent. It ultimately shifts federal communication efforts away from information provision and toward partisan promotion; away from nation building and toward political marketing (Kozolanka, 2006). In recent months, the Tories have been at pains to convince us that Michael Ignatieff “didn’t come back for us,” and that voting Liberal means voting away our nationhood. But while Harper peddles this rhetoric with one hand, he guts the nation and rebuilds it in his own image with the other. In it for Canadians? Think again. 100% agree with this article. i voted conservatives in to get change and voted for them every time since. No more. The agenda is clear. Big business. Align with USA. Sovereignty is no issue. All the while giving the opposite impression . The pattern is undeniable and has to be stopped now! Our sovereignty is ultimately melting away at an unprecedented pace. under the conservatives. Thanks for the comment, Kerry. Unfortunately, since this piece was posted, it seems the situation has gotten worse. I really hope that the opposition parties can mount a coherent messaging strategy that highlights the insane attacks on democratic process engineered by the Tories. The election certainly won’t be won the strength of the Libs, but with any luck, the Tories can lose it on their contemptuous relationship to the country.